You will love staying in this great location where 90% of the residents are local. They each have an interesting Key West tale to tell and are a very warm, friendly and diverse group. Here you will absorb the ambiance that made Key West what it is today. Varela St. Retreat is located in historic Old Town away from the bustle on famous Duval Street. 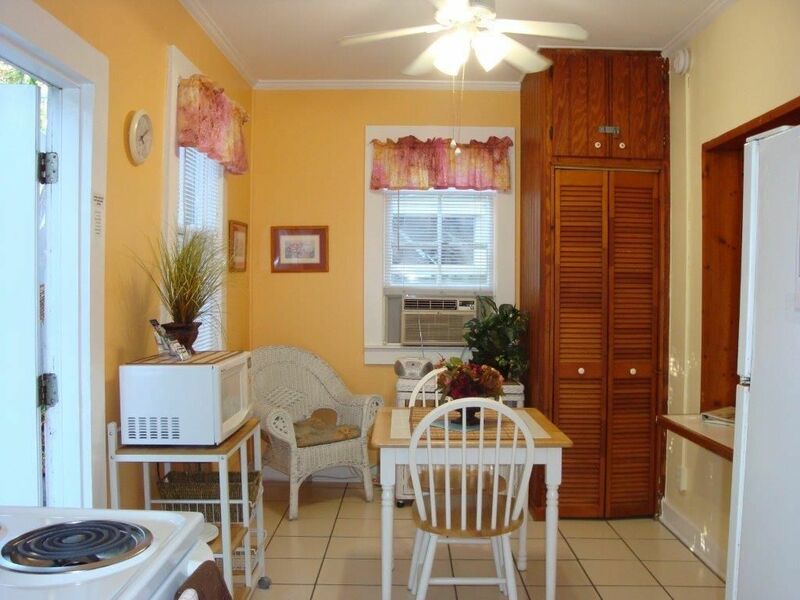 It is only half a mile to the closest beach and a 7 minute walk to Duval Street. It is less that one block to the White Street art gallery district, the grocery, the laundry, the largest city park,restaurants, shops, bike rental shop and more. Go ahead, kick your feet up and make yourself at home! You are about to enter Varela St. Retreat. Here you will meander back a secluded stone pathway to reach your very own private, spacious wood sun deck complete with lush overhanging tropical vegetation. A table and chairs and chaise lounge await you. You can dine out and soak up the warm inviting Florida sunshine,chat with your friends or just catch up on some reading. The front room of your apartment is a combination of a full kitchen and a separate dining/office area. The back room has a queen-size bed and a living area complete with a sleeper sofa. The bathroom has a stall shower. The apartment has all new ceramic tile and wood laminate flooring. Varela St. Retreat offers FREE parking right on the sides of the street in front of the Retreat. Also, ask me about a pool hook up if needed. So please come and make Varela St Retreat your temporary home while away from home! If you want to know what it feels like to really live in Key West and you like the benefits and homey feel of having your own kitchen, living area and either deck or porch this is a good fit for you. Plus my location is grand. I love being literally so close to everything and the beach. I'm located only 6 blocks from downtown. I'm located only 1/2 mile from the ocean. It's also a very nice walk to the beach. I'm located a nice 1/2 mile walk to the ocean and the beach. Free Parking on the side of the street in front of my home first come basis & not assigned. You must park where no words are written on the blacktop otherwise will get a ticket. It was a lovely spot, just what we needed, thank you! This was an idea cottage for my vacation. It was clean and spacious. I loved the full kitchen as well as the private patio outside. There wasn't much parking if you rented a car but you could pretty much bike anywhere you wanted to go and the bike rental was right down the street. Parking is beyond awful. The unit was very tight especially the bathroom. No view from the deck. My heart sank when I entered the street where unit was located. Again when I had to park in a 30 minute parking spot & move car again in order to unload belongings. Had I weighed 15# more I doubt I could have used the toilet. Lots of unidentifiable noises all night long coming from somewhere in & around perimeter of house.Neighbors were quiet. Personally I would not stay again. this review has little validity and is not fair. They could clearly see from the pictures before renting there is not a view beyond the deck since the deck is enclosed with a high fence except trees. Parking is tight over the entire island of Key West it is not indicative of my place. People go to Key West because of its history, charm and ambience. It is like Europe with houses small and close together. The farthest away from my home that I have had to park is about 16 parking spaces. It was not a real problem for me. Just understand the parking situation on the historic island of Key West. The bathroom is small but it does have everything you need. The toilet is in a small area and is tight. A very large person maybe over six foot four or over 225 lb might find it not workable. Lastly, the rates these guests paid was extremely reasonable for the dates they stayed. I checked around and the rate they paid was less than even a very mediocre tiny motel room only that I found on the island. Yet they had a full kitchen, a dining room and a nice private deck in a very good location close to the beach. Quaint place. Enough space and amenities for two. Would stay here again. My husband and I celebrated our 23rd anniversary in Key West this year. We were very pleased with the property. It was very clean, it has a warm cozy atmosphere, we felt comfortable and safe. The owner has thought of everything from swan shaped towels on the bed to everything you may possibly need for the kitchen. We enjoyed staying here much more than a hotel. It is quite, you have your own private deck with the back property that we were in. It is close to everything in key west, you can walk, ride a bike, or get around on a scooter. We will definitely stay here on our next trip to Key West. We loved it !! !